I grew up eating Bun Cha, my favorite was always the version with cup up eggrolls 🙂 For my husband’s lunch though I opted for pork meatballs, as I had some ground pork that needed to be used up. This noodle salad could just as easily be made with grilled chicken or beef, or even extra side veggies and shredded lettuce. In this box all of the veggies, nuts and muffin are organic. Also, this entire box is Gluten Free. 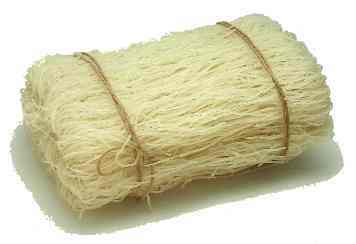 “rice vermicelli” – also sometimes labeled as “rice stick”, but don’t get them confused with the (wider) pho noodles or with the cellophane noodles (similar in shape, but clear)! If in doubt, look at the ingredient list, you want the ones shaped like super-skinny spaghetti that are made with rice flour. Cook the noodles until al-dente, then rise with cold water. I like to “nest” my noodles and squeeze out the extra water, but I know others just put the noodles in a salad-spinner before placing them on a plate to air dry a little. 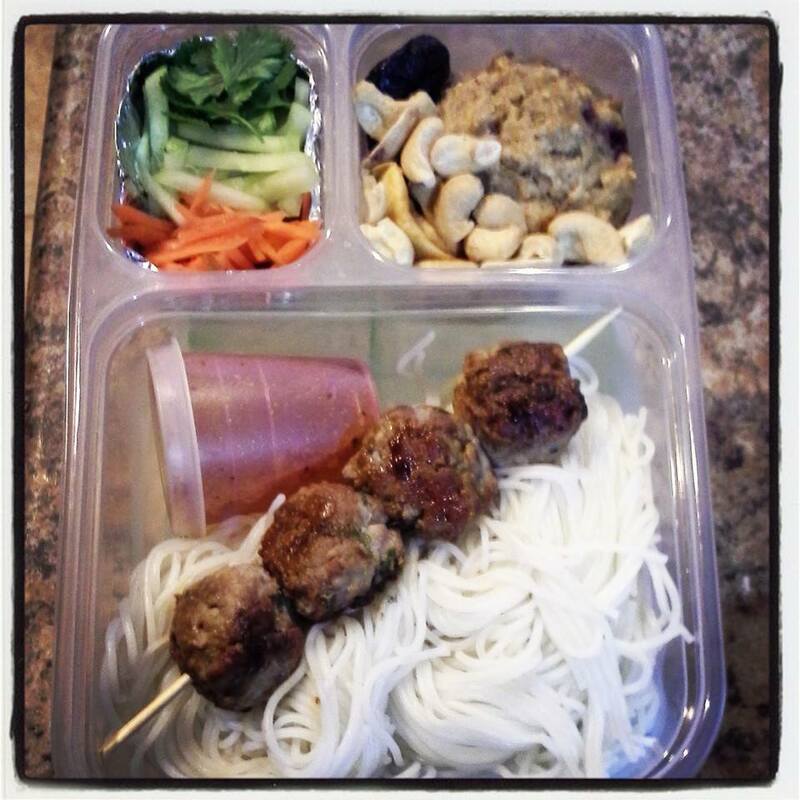 pork meatballs – here is the recipe I used. I wanted my meatballs to be extra flavorful, so I used the entire recipe on only 3/4lbs. of ground meat, and also added in a couple teaspoons of sesame oil. Also, since I was making mine in a frying pan vs. grilling them, I omitted the cornstarch and did not brush them with oil. Nuoc Cham sauce – this is the sauce that ties the flavors together, so good! I have to say, this sauce is sort of like how each individual likes their coffee a little different. The ingredients are the same, but amounts are adjusted slightly to suit personal tastes. This is the basic recipe I followed, but I prefer mine not to be too salty or too cloyingly sweet. So I added an extra couple tablespoons of water, went easy on the sugar and upped the spice level. pickled carrots – like the sauce, this recipe was also adjusted to my personal taste. I’ve found that since we started eating cleaner/organic food, we don’t need as much seasoning for the flavors to “pop” for us. I simply julienne 2-3 carrots (and daikon if you wish) and let them soak in a mixture of : sugar, vinegar, and water. I like to use : 1/4 cup sugar, 1/4 cup white vinegar, and just under a 1/2 cup water. Let the carrots soak for at least a couple hours before eating, store the remainder in the fridge. I also packed some julienned cucumbers and cilantro. The other parts of the box contain our favorite non-sorbate prunes from Trader Joe’s, organic roasted/salted cashews from Trader Joe’s, and an organic, gluten free, Blueberry-Oatmeal muffin. This is the recipe for the muffins, but I freely change things up. This week I used brown and white rice flours and added in some ground flax seed.